Summer is in full swing, and we're diving into all sorts of outdoor fun! During this time of year, there are three sunny activities that my children and I really enjoy, and those are biking around the area, having a picnic at the local park, and camping. We love this refreshing, down-to-earth (literally!) pastime because it unites us as a family and encourages us to purge out tech and material overload to just BE. If we can't make it to a campsite, the backyard suits our needs just fine! With little ones in tow, every camping excursion can feel like tackling Mt. Everest, but don't let that stop you! With some preparation and patience, you can be a one-family wolf pack that moves in perfect harmony. Although that last sentence may be a bit of an exaggeration, here are seven helpful tips to make your next trip as kid-friendly as can be. Bring some snacks: One of the best parts of camping is the food that comes along with it. Some of the traditional favorites, like campfire-toasted marshmallows and s'mores, are always necessities, but one thing that I've enjoyed throwing into the mix (no pun intended) is trail mix. It's protein-packed, delicious and easy to gobble down during the trek. By making your own, you can slash excess sugar and cater it to the family's tastes. We toss in hazelnuts, almonds, walnuts, cranberries, coconut shavings, multi-grain cheerios and dark chocolate hemp seeds. The possibilities are as endless as the open sky! Be enthusiastic about camping: If this will be your children's first camping trip, they may be timid and reluctant. In the event of this, be as enthusiastic as you can about the entire experience. Kids are very in tune with their parent's vibes, so try to exude energy and wonder. This is more effective than simply informing them that they're sure to have a wonderful time. Let the kids bring some toys: A first time camping trip is akin to leading them into foreign territory, so it's important to let them bring a few of their favorite toys so they feel more at ease. If you're gearing them up with brand new equipment, let them don their favorite socks, hair bows and jewelry. This will help them feel like they're meeting nature on their own terms. Bring your bikes: There are many benefits to biking, not only because it's a great form of physical activity but because it's fun as well. There are plenty of trails to conquer and puddles to splash through. Keep in mind that some state parks forbid bikes to slow erosion, so do some research beforehand. Appreciate your surroundings: Nature is amazing, isn't it? Soak in all of your surroundings. Take a look at the flowers, trees, and rocks around you. Relish in sharing the environment with wildlife. If you welcome the quiet and embrace the serenity, your kids are sure to follow. If you foster this appreciation early in life, it becomes a lifelong blessing; they become more independent, more healthy within and without and more connected to the world as a whole. Let everyone have responsibility: Camping and hiking duties can grow with the child; it will help them feel like a valued team player and build a strong sense of responsibility. Let them help you gather firewood, carry their own packs, aid in pitching the tent and concoct spooky stories around the fire! Safety first: The most vital rule of them all is to be safe. Camping can be a lot of fun for you and the kids, but take all of the necessary safety precautions, such as arming everyone with flashlights and spare batteries. If your family is avid about hiking and camping, consider taking wilderness survival courses and getting first aid and CPR certified. 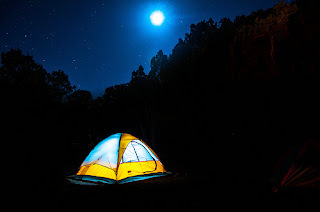 The great outdoors has so much to offer your entire family, and camping is a wonderful way to be fully immersed in it. If you've been camping with your kids, in what ways have you made it "kid-friendly"?